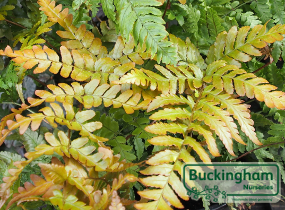 Striking, fast growing, clump forming, semi-evergreen, deciduous fern with young fronds vivid pink, slowly turning to bronze then finally green, with spores often pink. Old fronds should be trimmed in spring before new fronds emerge. Plant in a sheltered, moist position in shade or partial shade. Height 60cm, spread 0.5-1m.